The Reebok V 8.90 treadmill offers a list of decent features plus a new gimmick: a built-in weight loss center where you choose the number of calories you want to burn off. The Reebok V 8.90 treadmill has a blue backlit LCD display showing speed, time, distance, pulse, incline, and calories burned. Choose from 14 Quick™ Calorie-Burn Workout ranging from 200-500 calorie burn sessions. The console has an iFit® card slot and comes with two free Weight Loss cards to get you started. Doesn’t this sound great: Built-in sound system for your MP3 player, 14 pre-programmed workouts plus the iFit® card system, a folding design, handlebar grips for the heart rate sensors, a 10% power incline, and a 2.8 hp motor. 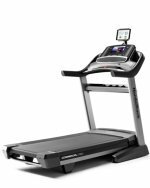 But one issue with the Reebok V 8.90 treadmill is the Weight Loss Workout Center that allows you to pick walking or running workouts according to the amount of calories you want to burn. For example, you can choose “500 calories” with the push of a button for either a walking or running workout. The problem with that is calorie-counting monitors on treadmills are notoriously inaccurate. It’s gimmicky for Reebok to base the V 8.90 on calorie-burning counts since the calibration could be overestimated by 20% or more. For best results, buy a personal heart rate monitor (about $60) to track your heart rate and calories accurately, and use it on any treadmill you buy. 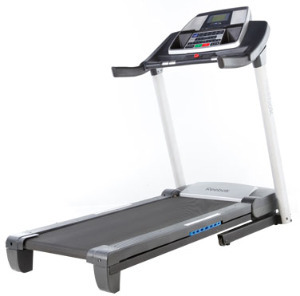 As for the construction, the Reebok V 8.90 seems to be one of those models that treadmill reviewers either love or hate. Some customers have reported no problems while other say the V 8.90 would not turn on after assembly, or the holes didn’t line up for bolts, or the frame was bent at the factory. In fact, there were an unusually large number of reviews that said the unit was broken right out of the box. When the motor goes on the fritz or something else goes wrong, owners report that Reebok’s customer service is very poor and that they had trouble getting someone to even answer the phone. At first we thought the $1,299 price on the Reebok V 8.90 was a misprint. Apparently, that’s what it costs, which means the V 8.90 is extremely overpriced compared to other models on the market. For $1,299, go with a Yowza, Sole or Smooth treadmill. They all have continuous duty motors, 12% - 15% inclines, better belts and decks, and better warranties. The Reebok V8.90 treadmill is not a good deal.